Once upon a time, there was a little girl who fell in love with fairy tales. She spent many an hour daydreaming of being a princess and living in a castle. Well the little girl grew up, but her love of fairy tales and fascination with castles remained. Seeing the castles was one of the things I was most interested in while in Ireland. There is no shortage of them to discover. One of the things that struck me about the castles was that they just kind of appeared when you got close to them. You couldn’t see them from a distance – you would think given their size they would dominate the landscape but they really just melded into it. We were actually on our way to one and we drove right past without seeing it – when we realized we went too far we turned around and driving back exclaimed “It’s right there, how in the world did we miss it!” For me this just added to their allure. Kilkenny Castle was the first one we toured. It had been painstakingly restored to its original grandeur. Walking throughout it there were photographs and descriptions showing the work that went into restoring it. I’m so glad the time and money was put into this. It would be such a shame for these places to go into complete disrepair, eventually to be lost forever. I enjoyed seeing the décor and furnishings as they would have been when it was occupied over eight centuries ago. Lismore Castle was the grandest we visited. Much to our surprise this is still a private residence. Can you even imagine? Architecturally it is beautiful and quintessentially what you would expect a castle to look like. Although you aren’t able to go inside you are permitted to walk the grounds and gardens, which are impressive on their own. There is a charming area decorated as a fairy glen for children, sculptures throughout including two sections of the Berlin Wall, herb, vegetable, and perennial gardens, as well as beautiful trees and flowering shrubs. I fell in love with Ballyscaggartmore Towers. This is the fairy tale castle me, the princess, dreamed of living in. While not a complete castle, the structures here capture the imagination. It’s nestled in a “fairy” wood sprinkled throughout with remnants of days long gone by. Lough Eske in Donegal is a castle that has been converted into a five star hotel. We had the privilege of spending one night here. We just missed hobnobbing with actual royalty, Prince Charles was staying there the week before. It was wonderful! This does make you feel a touch like a princess. Not far from the castle is a wooded walk along a picturesque lake. It is so relaxing to be in such a decadent atmosphere. Bunratty Castle is fun. You can wind your way up narrow staircases to see rooms throughout the castle reminiscent of the 15th and 16th centuries. I was happy we got to explore it when it wasn’t crowded because navigating through the narrow passages in a crowd would have been awful. It is part of a folk park that recreates the experience of a working 19th century village. You are able to get a sense of the class structure and see how things were done such as milling, printing, baking, and pottery. We also participated in a medieval dinner at the castle complete with traditional music and storytelling. It was a very entertaining experience. It was great exploring the real deal – for now this princess will need to go back to daydreaming. Perhaps even some story telling inspired by another era. A month ago I had the pleasure of touring across the Emerald Isle. It was a glorious week – I wish it had been longer! Knowing Ireland’s propensity for rain – I had prepared and brought all kinds of rain gear with me. It was never needed – the weather was spectacularly beautiful for the entire trip. Perhaps some of the “Luck ‘o the Irish” was with us where the weather was concerned – it was a bright blue sky vacation. One of the first things people say about Ireland is how green it is. It definitely lived up to that expectation. I didn’t realize quite how rugged it would be and I wasn’t expecting to see so many mountains. Before I got there I was envisioning rolling hills and farmlands and there is plenty of that, but so much more! The Wicklow Mountains are breathtaking. In this region we visited the Powerscourt Estate and Gardens and Waterfall as well as Glendalough. Arriving at Powerscourt early, there was a slight wait until it opened. A bus of Japanese tourists arrived at about the same time. While wandering around taking in the beautiful mountain views, one of the Japanese women began to sing. She had a beautiful voice and although I have no idea what she was saying it was like an homage to the mountains and seemed such a fitting and respectful way to start the day. At the estate, every vantage point, nook, and cranny held amazing views. All shades of vibrant greens were present, sprinkled throughout with the reds, pinks, oranges, and yellows of the rhododendrons throughout the paths. The waterfall drapes itself down the side of the mountains flowing into a rocky riverbed. Travelling further down the mountains you reach the ancient monastic site of Glendalough. Walking through here you feel nestled in a serene valley, surrounded by mountains where a river runs into a quiet lake. I really just could not get enough of the beauty surrounding me. One of the stops that truly captured my imagination was Ballyscaggartmore Towers. As a lover of fairy tales and folklore – I felt like I walked into a storybook here. You follow along wooded trails where trees and rocks are lushly green and moss covered. Wild rhododendrons provide pops of color along the way. Then suddenly you come across beautiful guard towers on either side of a bridge crossing a river. I half expected to see trolls coming up over the sides asking for the tolls to cross. Further along the trails you come across the beautiful remains of a castle entrance – the castle itself was never completed. I kept waiting for a fairy to appear – my mind was overflowing with thoughts of fantastic creatures and kings and queens. The Ring of Kerry does not disappoint, from mountains to ocean views and everything in between. This area gives you a sense of the country’s ruggedness as you wind your way through mountains and valleys on narrow roads. Almost every view along the way is picture worthy. There really is something for everyone – lakes, rivers, stone circles, ruins, waterfalls, peat harvesting; you name it, you will likely see it along this route. One of the highlights for me was our stop at one of the beaches. I really got a kick out of putting my toes in the water on the opposite side of the Atlantic. Sometimes it really is just the little things. The Cliffs of Mohr – WOW – this is a wonderfully magnificent site. We spent the better part of a day wandering around the cliffs just trying to take it all in. I think the only thing that got us to leave was hunger setting in. You are high up there! I braved the inner trail to walk along the cliffs but didn’t really venture too close to the edge. At times it can feel a little disconcerting as you are walking along. The sides of the cliffs were interspersed with wildflowers cascading down in a blanket of pink, purple, and white. There is a breeding site for puffins along one side and I was hoping to get a glimpse of them. No such luck – I could hear them, but I could not see them. This was a wonder to see and we were so blessed to have such a beautiful day to spend there. The Carrowmore Megalithic Cemetery was like nothing I had ever seen before. Over rolling grassy hills stood dozens of chamber tombs, ring forts, cairns, and passage graves dating back to 4600-3900 BC. This was a site that brought some of the folklore of the region to life. I felt like I had taken a step back in time. You could see another large cairn up on one of the mountains surrounding the site in the distance. I felt the mystique of the site as I wandered from grave to grave. Mother Nature has certainly out done herself in Ireland. There is so much natural beauty here. It was glorious to be able to relax, bask in the sun, breath in the air, and be surrounded by splendid sites. It recharges the batteries and offers a fresh perspective. It just piqued my interest more and I hope to some day return and explore even more areas. There is so much I still want to see and do here! ​In 2013, while visiting family up at the Lake House, I came across an advertisement for Mosaïcultures Internationales® at the Montreal Botanical Gardens. It looked interesting and my cousin Heather and I decided to take a day trip to go see it. I had no idea what to expect, but I generally enjoy gardening and had never been to the gardens in Montreal, so I was eager to check it out. The theme of the event was “Land of Hope.” Its focus was on the interrelationship between humans and the environment they live in. All exhibits were created from natural materials, such as various florals, mosses, stones, grasses, and wood. Some of the displays were more thought-provoking while others were quite whimsical. I was truly amazed at the beauty and intricacy of the exhibits. As we walked in, we first encountered some smaller exhibits. A row of ring-tail lemurs, a castle, and a figure performing a folk dance were just a few. Then we got our first glimpse of one of the larger exhibits, “The Man Who Planted Trees.” I was blown away. The scene was inspired by a French fable and presented a figure of a shepherd with his flock of sheep, kneeling and planting a tree. It was magnificent. As we continued our walk through they just kept getting better and better. My second favorite was “Mother Earth,” this consisted of the bust of a goddess surrounded by animals, plants, and a waterfall falling from her outstretched hand. It was absolutely extraordinary! From the ducks, to the pandas, to the tree full of birds the entire exhibition far exceeded my expectations. I’ve included a slide show but the pictures don’t do the displays justice. If you are ever able to see this event in person – it is a must see. Prior to this visit, I had never heard of Mosaïcultures Internationales®. It is a competitive event, held every three years. Professional horticulturalists from around the world are represented. The exhibits must adhere to the theme and must integrate some aspect of the culture from the countries they are representing. The event will be held in Antalya, Turkey in 2016 with a theme of “Flowers and Children.” I wish I could go and see it. Plans are being discussed for Mosaïcultures Internationales® of Montreal to exhibit in Gatineau, Quebec as part of the 150th anniversary of Canada’s Confederation in 2017. Funding issues are being addressed that may hamper the scale of the planned exhibition. I for one hope they are able to move forward with it, as I would love to make the trip to see it. If you are interested in more information on Mosaïcultures Internationales® visit http://www.mosaiculture.ca/en/. In 2013 I took a two-week vacation to France with two friends, Carolyn and Sarah. The first leg of the trip we spent in Bayeux in the Normandy area of France. It didn't take me long to fall in love with this charming city. It is a blend of history and architectural styles from many different centuries; wandering around you never knew what you might see around the next corner or in it's many nooks and crannies. One morning, for example, I went out for a walk to the botanical garden. While wandering through the gardens I came upon an amazing tree. It was a 150-year-old weeping beech that was designated a natural monument in 1932. The canopy of the tree was massive and you could walk underneath it's old gnarled branches. Oh the stories I bet this tree could tell! By a happy accident we were visiting during the anniversary of D-Day. We didn't plan the visit for this event, but I was thrilled we just happened to choose this time to go. Bayeux was the first city to be liberated. The entire time we were there the city was playing music from the forties through the streets; there were men dressed in military uniforms (some current and some from back in the day); and there were military jeeps, motorcycles, and tanks from that period being driven around. It felt as though we were reliving a small bit of history. We spent a day touring some of the beaches of Normandy: Arromanches, the German Battery, Omaha Beach, and Pointe du Hoc. It was a living history lesson. It takes on a whole new meaning when you see these places up close and personal, it becomes very real. To see the beaches and the cliffs that were scaled, the impacts of the shells and damage done to the land and structures, as well as the extent of the areas involved really hits home. These places are beautiful but will be forever scarred and filled with the ghosts of that era. ​ As we were planning the trip and sketching out an itinerary, Carolyn's wish was to visit Cherbourg. One of her favorite movies is Parapluies de Cherbourg and she wanted to see the city it was filmed in. While walking through Bayeux one evening we happened past a poster advertising the 50th anniversary of the movie and it was being commemorated with walking tours of the sites highlighted in the film - another happy accident! Cherbourg is a coastal city in northern France. One of the things that struck me as so odd and out of the ordinary was that there were palm trees - this wasn't something I ever expected to see in Northern France. The site that I found the most memorable was the Basilique Sainte Trinte, it was beautiful inside and out and had charming seaside touches (the font for holy water was a seashell). It was a completely different experience and I'm so glad we worked this into our plans. We took two additional day trips while staying in Bayeux, we visited Rouen and Mont Saint Michel. Rouen is another city filled with beautiful architecture and rich history. The sites throughout that most intrigued me were those related to Joan of Arc, from the tower in which she was imprisoned to the church built in her honor on the location where she was burned at the stake. It was another instance of historical stories merging with reality. Mont Saint Michel is an utterly unique experience. It is a walled city that at high tide is an island and at low tide is surrounded by sandy plains. At the very top of the island is a medieval monastery. There is a winding road you can walk up to the abbey lined with shops and restaurants on either side. There are also stairs along the wall you can climb to get up or down as well. You get a sense that time has forgotten this place as you wander around - it looks very much like it did when built centuries ago. It is a truly spectacular site. The second leg of our vacation we spent in Paris. I enjoyed every bit of the time I spent here. We did most of the very touristy sites: the Eiffel Tower, the Arc d'Triomphe, Notre Dame, Tuilieries, the Louvre, Sacre Coeur, and so on. One site is as amazing and beautiful as the next. One of the things that always strike me when I visit sites that date back centuries is the grandeur of the size and fine detail in the architecture. When you think back to the tools that were available to build these structures and to see the scale and ornate design it doesn't seem possible. It amazes me! The Louvre is astounding. We spent a day there and still didn't see everything. I think you could spend an entire week in there. Among my favorites were the sculptures; the attention to detail and intricacy of some of the carving is extraordinary. There was a particular statue of a man feeding a baby in his arms with a dog underneath his legs licking the baby's foot; it charmed me. One of the surprises for me was the size of the Mona Lisa. You imagine she is going to be a pretty large portrait and you walk into the room and she's by herself on the wall and she is quite small. (The painting is about 30" x 21"). I really enjoyed seeing in person the sculptures and paintings that I have only seen in books. There is so much of it in just this one place it is almost overwhelming. The amazing talent of the artists on display leaves you awestruck. One of my favorite buildings visited was the Opera Palais Garnier. It was gorgeous. This is the site that inspired the story Phantom of the Opera, a favorite of mine. Every space in this building is stunning in it's detail and ornate decor, from the Chagall ceiling to the grand halls and stairways. It is a feast for the eyes and senses and I couldn't get enough of it. I even found some bronze statues of mice on one of the staircases. As luck would have it, there were some ballet costumes on display on one of the floors - as an avid fan of the ballet this was a treat. The only thing that could have made this visit better was to be able to see a ballet here. You expect the main attractions in Paris to be incredible and they do not disappoint in any way. But one of the things I enjoyed the most was just wandering around and happening upon small nuances that I found to be captivating. Whether it's a street lamp, a sign outside a store, or a fountain in a small park, everything has a flair of the artistry and ambiance of the city. It was these wanderings that kept me from getting to some of the museums and sites I initially wanted to see - but these enchanting distractions were well worth it. People watching in Paris is a treat as well. One sunny afternoon we sat in the grassy park by the Eiffel Tower just relaxing and taking it all in. It was a lazy day, a break from all the sightseeing we were doing. There were people from all walks of life milling about. This woman caught my eye, she was with a small group of people - they looked a bit gypsy-like in dress and mannerisms. She was wearing a long, billowy skirt. I watched as they walked across the park where we were lounging. The next thing I know I see this woman suddenly cop a squat, then get up, shake her leg, and keep going. When it dawned on me what she had just done I laughed. She was so nonchalant about the whole thing. My next thought however is "What in the heck could I be sitting on?" On another one of my wanderings I found myself strolling through the garden of Tuilieries. I was taking pictures of the garden plots and I happened upon a sheep tethered along side one of them. No one was with the sheep - he had a little shelter he could retreat to down this little embankment, no one bothered him and he didn't seem to be bothered by people wandering past. It seemed so random and out of place. Come to find out some areas in Paris use the sheep to keep the grass mown. One of the most fun nights we had in Paris was attending a show at Moulin Rouge. There were several over the top, elaborate production numbers and in between smaller, more vaudevillian acts. The smaller acts ranged from jugglers, to acrobats, to a woman performing in a tank with giant snakes (I was really happy not to be close to the stage for that one!). In the larger numbers the costuming was beautiful and the sets colorful. The production numbers seemed to become more and more extravagant as the show progressed. The grand finale, as expected, was the most grandiose. It was during this performance when Carolyn leaned over to me and said, "What the f*%*, ponies?" I couldn't stop laughing; yes on stage a tiny little pony all decked out in feathers and beads escorted each dancer. After the show we had arranged for shuttle transportation back to our hotel, at least that was what we thought. While in the van, American music was playing, and I began to sing along with Alicia Keys, "This girl is on fire". We were in a good mood (admittedly I may have had a wee bit too much champagne) but the van stopped, rather abruptly, and we were told this was where we were being let out. We weren't at our hotel; we didn't know where we were. The driver claimed this was as far as he was permitted to take us because our hotel was outside the Paris city limits. I suspect perhaps it had more to do with the singing, although I really don't think I'm that bad! There was a metro entrance not far from where we were deposited but quickly discovered that it stops running at midnight. A taxi it was! Thankfully we had no trouble getting one. It was definitely an experience to remember. The only day trip we took from Paris was to see Versailles. It's hard to believe this began as a simple hunting lodge! It is so opulent. We toured the palace and gardens and visited Le Petit Trianon, Marie Antoinette's estate. The gardens are more vast than I ever imagined - you could spend the entire day wandering around in them. There is even a lake that you can rent boats to go rowing in. It was unfortunate that we visited on a day when the fountains were not on. That would be a sight to see. I found Marie Antoinette's home to be charming. I especially enjoyed the garden in the back with a gazebo and a swan. I could be quite content living on a "little" estate such as this out in the French countryside. Despite spending a week in Paris, there is still more I would love to see and do there - I'll just have to make it a point to go back someday! My first visit to Europe was in 2002 with my then boyfriend of 13 years. The only plans we made for the trip was a list of the places we wanted to visit. This consisted of locations in Germany, Austria, Italy, France, and England. It was an ambitious plan for the two weeks we had to spend there. With just backpacks and a loose itinerary, we boarded a plane and off we went. It was exciting and we were enthusiastic. There are advantages to approaching travel in this manner. One being that you are not beholden to a planned schedule of events. We were able to arrive in a location and decide what we wanted to see and do on the fly. If we were enjoying ourselves and we wanted to stay longer, we were able to. Although this was also a challenge, as you inevitably want to stay longer once you are in a location because you quickly discover there is just so much more to see than you originally thought. Another advantage is you are able to find those "road less traveled" locations that are less touristy and more authentic to the local culture. That was a goal of ours on this trip. We really tried to find these experiences in the places we chose to eat and stay. One of the biggest challenges of the trip was having to find a place to spend the night. Since we made no advance reservations, as soon as we got to a location the first thing we had to do was find lodging. Sometimes this was easy and other times proved more difficult. We stayed mainly in rooms people rented out of their homes. This was a nice way to get that true cultural experience and the renters were friendly. In some of the larger cities, we stayed in small hotels. When both of those options failed us we opted for a hostel. Getting from point A to point B was mostly done by train. The schedules are challenging to navigate but the views are amazing and make up for some of those bumps you encounter along the way. I loved that you would just be taking in these beautiful mountain scenes and then suddenly, all by itself, would sit a castle. There were also remarkable views of waterfalls and glaciers in-between mountain peaks. We did a lot of traveling through the Alps and the French and English countrysides on this trip. Traveling through the country was beautiful but anywhere you went in the Alps was truly spectacular. Our trip began in Germany. We flew into Munich and travelled south to Prien am Chiemsee, our first stop. This is a charming lakeside resort. It reminded me of many of the well-known lake resorts in the States. It was my impression this was a popular local get-away and vacation destination. We didn't spend much time here however; it was a stop over on our way further south. Our next stop was Berchtesgaden, a spectacular small town nestled in the Bavarian Alps. The views here are stunning. This was one of the most beautiful locations we visited. As a happy accident, we were there during Spring Volksfest, the springtime and smaller scale version of Oktoberfest. We spent one evening in a traditional German Beer Garden - and yes I even tried the beer! There were rows and rows of picnic tables, German music and food, and plenty of mugs of ale. It was a fun peak into a traditional German festival and custom. One of our day trips from Berchtesgaden, was Salzburg, Austria, just over the border. Salzburg is the home of Mozart and The Sound of Music. We wandered the city, taking in the architecture and sights. You feel a bit like you have stepped back in time here, there are still horse drawn carriage rides around the city and it is rich with history and culture. One of my favorite stops in the city was the garden of Mirabell Palace. On another day trip we visited Lake Königssee. Wow, was this breathtaking. We took a boat tour of the lake, which is surrounded by steep mountain walls. It makes you feel tiny! The water and setting is pristine. This is actually one of the things that impressed me the most about this area of Germany. It is the cleanest place I have ever been. You don't see liter, nothing looks polluted, even stacks of wood outside homes and lumbar yards are precisely stacked - not a log out of alignment. It was difficult to bring ourselves to leave, but our next destination was Italy. Our first destination in Italy was an old walled Etruscan town, Orvieto. It sits high above the Umbrian plains and offers beautiful views of the countryside surrounding it. This was another stop that made you feel as though you travelled back in time; not much has changed here from ancient times. The roads are narrow, stone, and there is very little vehicle traffic. One of the most beautiful buildings here is the cathedral. From Orvieto we made a day trip to Rome. This far exceeded my expectations. The scale of the ancient buildings is massive. It is hard to imagine how these buildings were created and so elaborately sculpted and decorated. There are runes and sculpture everywhere you look. There were statues and columns lying in the street gutters - it's as if there is just too much to even know where to put it. In Rome we stuck to the traditional tourist sites, the Trevi Fountain, the Spanish Steps, the Colosseum, and the Roman Forum. I probably spent the day with my jaw dropped open, it was just amazing to see. While in Rome we also visited Vatican City and ventured into the Vatican. There was actually a funeral taking place in a section of the Vatican when we were there. It felt so odd to me to be wandering around inside with that happening. It felt so disrespectful, we didn't spend much time there. Our next destination was Siena, in Tuscany. We wandered around the piazza Il Campo and I was fascinated by the fact they ran horse races there in the summer. The city is very picturesque. The Palazzo Pubblico and the Torre del Mangia were the buildings that were most memorable for me here. Our last destination in Italy was the Cinque Terre area on the Italian Rivieria. This region consists of five villages; Monterosso al Mare, Vernazza, Corniglia, Manarola, and Riomaggiore. The land of the these villages is all terraced and you are able to walk trails (Azure Trail) along the coastline from one village to the next. The views along the coast are beautiful. As you hike between villages you are traversing through gardens and vineyards; I think you need to be half Billy goat to live here. We only had time to hike one of the trails - I wish we could have done them all. We spent a day on the beach while here. The beaches, particularly where sand meets water, are more pebbles than sand and is a bit hard on the feet. All in all Italy was fabulous and I would love to get back and spend so much more time here. My father's side of the family is 100% Italian. I grew up surrounded by my Italian relatives. On one side of our house lived my grandparents; on the other side lived my great grandmother and one of my great aunts. My great grandmother was from Naples and came to the U.S. through Ellis Island. Just about everyone in my father's family spoke Italian. I'm pretty sure my father knew more than he let on, but I never heard him carry on a conversation in Italian. As for me, I know some words (but not the kind you use in polite company). The language was something I was very accustomed to listening to, although I never understood what anyone was saying. One of the most difficult parts of traveling to other countries is not being able to speak the language. I know absolutely no German and found it very challenging to ask questions and communicate. It was a lot of words and gestures trying to get someone to guess what you were trying to say. So after spending several days in Germany, I was looking forward to moving on to Italy, at least the language was familiar even though I couldn't speak it. At one point we were waiting in a train station and there were two older Italian men sitting on a bench arguing with one another. I started to giggle; I felt like I was at home. That's how my Italian family communicates; they always sound like they are yelling. Very rarely are they angry; they're just loud and animated. Listening to those two men put me at ease; it was the first time on the trip that I didn't feel like I was in a foreign country. I think my great grandmother was with me on this leg of the trip. She used to have this thing; it was so embarrassing. She would go to the grocery store and instead of buying the generic product that was on sale she would buy the name brand. When she got to the register and the clerk would try to tell her she had picked up the wrong product, she suddenly couldn't speak English. She "No understand." They would get so frustrated that they would just sell her the name brand product at the sale price. We wouldn't be out of the store five minutes and she would be laughing. She knew exactly what she was doing! Well, at one point we got on the wrong train and we needed a transfer ticket that we hadn't purchased. The conductor came around punching tickets and tried to explain this to me. I pulled a Michelina, "I no understand." He wasn't happy, but he didn't make us buy the transfer ticket. I'm sure she got a laugh out of that! My great grandmother also had a habit of going to the grocery store everyday. She would almost always only buy three things. I often would ask her why she didn't get all of her groceries at once, "ayehee" was generally the response I got. It wasn't until I traveled around Italy that I understood why she did that. I never saw a grocery store anywhere I went; there were however small stores selling specific items (a butcher shop, a pastry shop, etc.) and many stands for produce. You went to these market squares and you bought what you needed for the day. Everything was always fresh. It was how she was raised and she never changed. It is hard to argue with this method; I bought a bag of cherries from a stand one day, they were the best cherries I have ever eaten. To this day, I have never found cherries here that could even come close. I think one of the things I enjoyed the most about Italy were these connections to ancestry, and my great grandmother in particular. I came to have a greater understanding and respect for "her way" of doing things. Paris is known for being one of the most romantic cities in the world. I was thrilled I would be visiting it for the first time with someone I loved. I have to admit my expectations were high. I had visions of walking hand in hand along the Seine, climbing to the top of the Eiffel Tower, and a romantic dinner with a view. Boy, was I ever wrong! The trouble really started two days before. The master plan was to travel up the coast of Italy and ride the gondola up over the mountains into Chamonix, France. This route promised a breathtaking view of Mont Blanc and the Matterhorn; we were both really looking forward to it. Getting to the base of the lift was a bit more challenging than we had worked out. We took a train up to Aosta and then a two-hour bus ride up to the base only to arrive 10 minutes too late - the gondola had closed for the day. We were stuck. We found a place to spend the night and tried to make the best of it. At the crack of dawn we were back up at the gondola - ready to be the first ones on! Mother Nature however had other plans. It was too windy to safely run. We waited several hours hoping that the winds would ease up and we could get over but they decided to close the gondola for the day - the weather was just too bad. To say we were disappointed would be an under statement. Grumpiness was starting to set in. Our only option, take the two-hour bus ride back to Aosta and get on a train to France. As luck would have it, there was some issue with the train while traveling through Switzerland; we had to take a bus from one train station to another. On the bright side, this did allow us to experience a bit of the local culture, the bus had to stop at one point as a herd of sheep was shepherded down the street. This is not something you see every day! Well, if you live in whatever town we were in you probably do, but for this American tourist it was a first. It at least lightened the mood ever so slightly. We finally arrived at the train station and just barely made it on the last train to Paris for the day. We lost two days of site sightseeing, we were spending the night on the train; we were tired, hungry, and cranky. We finally arrive in Paris around mid-day. The train station was hopping - there were all sorts of soccer fans wearing team colors and cheering and chanting. It's hard not to get caught up in the enthusiasm and energy - I started to perk up and get excited. As is typical of this trip, the first thing we needed to do was find a place to stay for the night. This is where I need to tell you that my boyfriend worked for Marriott hotels. He could get an employee discount at any Marriott property. On this trip we wanted to get the full European experience and stay at locations off the beaten trail and up to this point it was great. However, given the difficulty in getting to Paris in the first place and that it was the middle of the day, I wanted to just find the Marriott and be done with it and enjoy the rest of the day. He refused to do that. I was not happy! So we are walking down the streets of Paris looking for a hotel and I realize we are walking past the Louvre. The Louvre is blocks long - and I want to be inside looking at the artwork not walking past it. With every step as we walk along beside the building I grew angrier and angrier. We finally find a hotel in an old historic building - had I been in another frame of mind I would have been charmed by the architecture and ornate detail. The aesthetic was where the charm ended - you needed to say a Hail Mary while riding the elevator, the room was well worn, as were all the amenities such as towels and linens. But it was just over night and now that we had found a place we could go out and explore. However, we weren't on the same page about what we wanted to see. We ended up wandering aimlessly, we went by Notre Dame, Moulin Rouge, and we walked along the street above the Seine. It was not romantic; there was nothing remotely romantic about any of it. We didn't have time to take in any museums. We didn't venture anywhere near the Pont des Arts - probably a very good thing, since there likely would have been something going over the bridge and it wouldn't have been a set of keys - there would be no Locks of Love on this visit. We found someplace to eat that wasn't even memorable and by that time the sun had set - I wanted to go to the Eiffel Tower. He however decided that Paris was too dangerous to walk around in at night. It's the City of Lights - are you kidding me! At this point we were no longer on speaking terms. We went back to the hotel in silence where I just got into the bed, which consisted of a mattress on the floor and pillows that were sewn, yes sewn, to the bedding. We left the next morning. ​ My first trip to Paris - a total disaster! 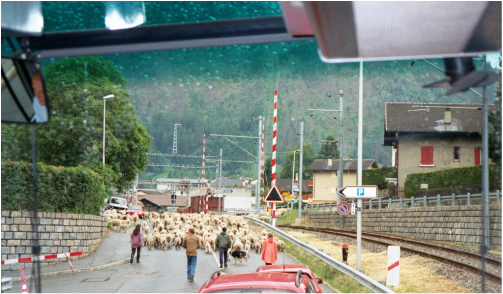 Just in case you thought I was kidding about the sheep being herded through the street in Switzerland. I love to travel. For me it is an escape, sometimes a reawakening, often enlightening and inspiring. I hope you enjoy the stories of "my adventures." If I inspire you to have some of your own - all the better. Bon voyage!